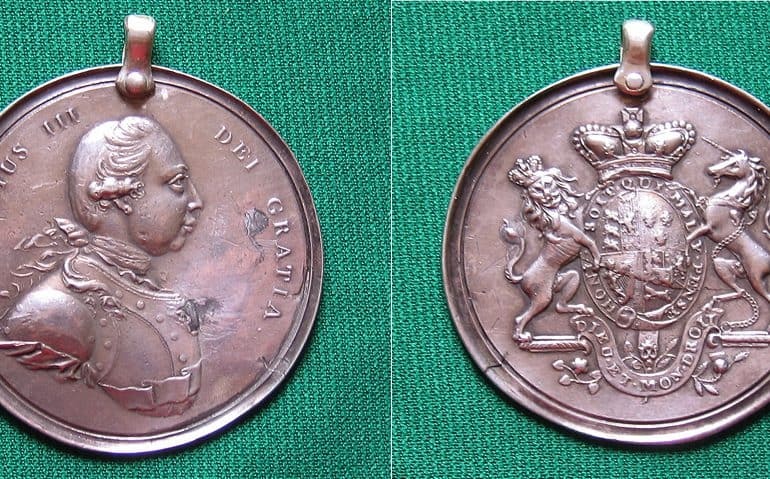 This is a large undated George III Indian Peace Medal, 77 mm diam. Struck apparently as one solid silver piece in a collar with integral rim. With original silver cast hanger. 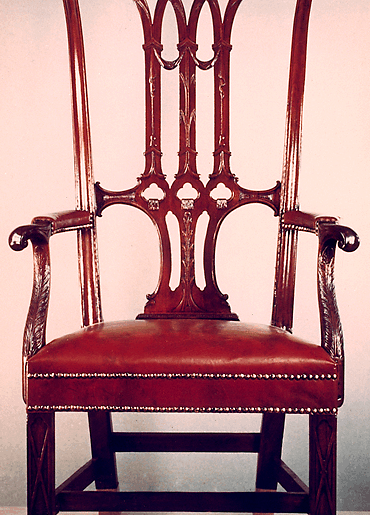 State: Adams 7.3: Obverse single curl to hair; seven rivets above sash, one below. No evidence of die break yet across the sash as on later 7.3 specimens. Reverse: “B”, Lion’s paw rests on I. Original hanger. Solid struck. 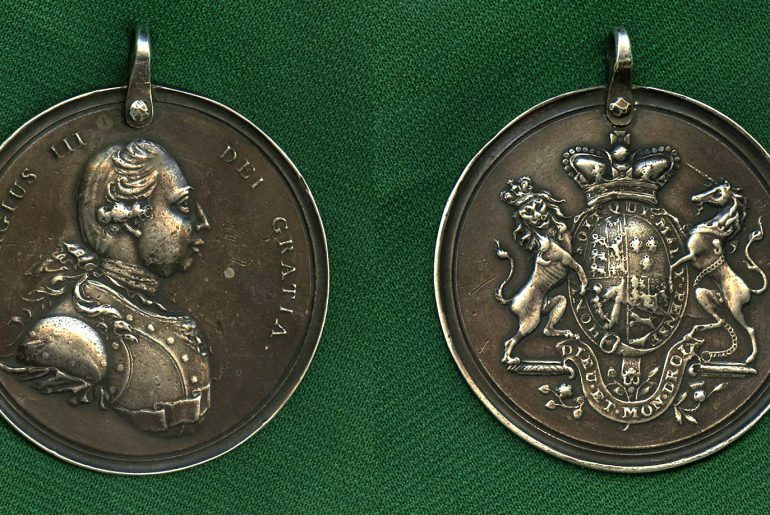 A superior specimen of this famous medal of the Revolution to War of 1812 which was presented, especially in the large size, to Indian chiefs allied with the British forces between New York and what became known as the Northwest Territory which covered all of the modern states of Ohio, Indiana, Illinois, Michigan, Wisconsin, and the northeastern part of Minnesota. The area covered more than 260,000 square miles. 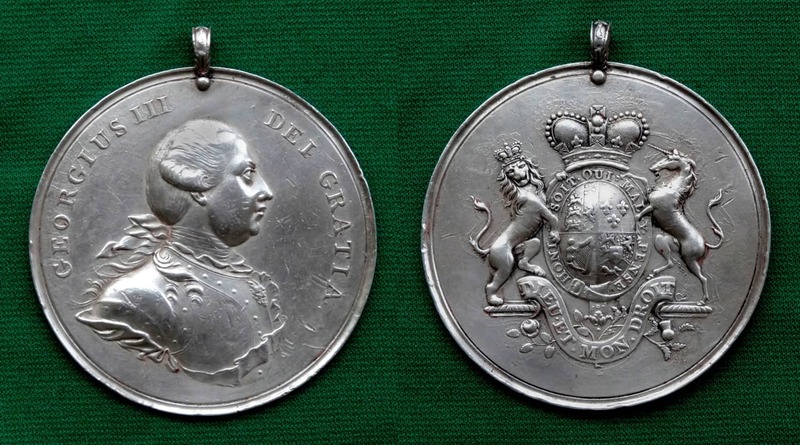 Large George III peace medals have sold at auction over the last 10 years from $5500 to $24,000, the latter with two presentation documents of the 1760s (so not for the medal with them), depending on condition, completeness (original hanger) and provenance. In the last three (four?) years none have come up at auction. No information on private sale prices.